CRE Tech® Inc. Blog: Now, Flood Risk Analysis in TheAnalyst® PRO! Now, Flood Risk Analysis in TheAnalyst® PRO! Is the property you’re evaluating at risk of flooding? Want to learn of any nearby high-risk flood zones? This summer, we introduced the Location Risk Analysis* function within TheAnalyst® PRO. The first component identifies environmental issues within a half-mile radius of the address entered. Now, we’ve expanded the Location Risk Analysis to include flood information. 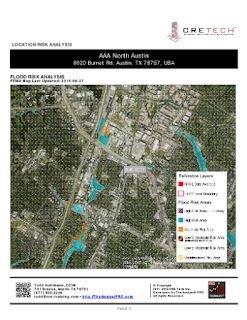 You can use TheAnalyst® PRO to prepare a 2-page report displaying a map of FEMA-designated flood concerns in proximity of any address entered. This is a valuable resource for property owners, brokers and commercial lenders—added at no additional cost to your subscription of TheAnalyst® PRO. You can find Location Risk Analysis in the "Other Tools" section of the application. View a sample Location Risk Analysis Report. MAKE ANALYSIS SIMPLE with TheAnalyst® PRO. *TheAnalyst® PRO's Location Risk Analysis functions have multiple patents pending. This technology is exclusive to CRE Tech, Inc., and TheAnalyst® PRO. Copyright 2016 CRE Tech®, Inc. Picture Window theme. Powered by Blogger.